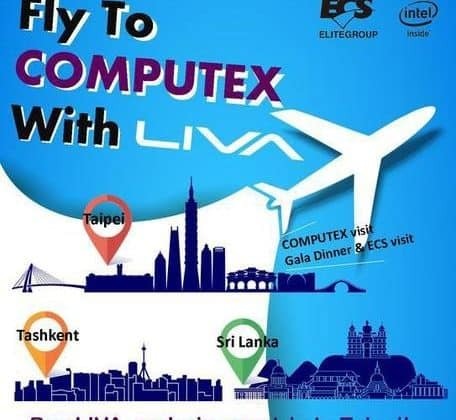 In order to make business more rewarding for Indian channel partners, Elitegroup Computer System (ECS) rolls out a promotion program focus on its innovative mini PC – LIVA. The scheme focuses on LIVA family products, including LIVA X, LIVA Z/ZE and LIVA ONE. The promotion started on 1st January and will last till 15th April 2018. Partners who buy LIVA family products will get respective points. Once accumulate required points, partners can redeem amazing rewards such as 2 nights 3 days trip to Sri Lanka and 3 nights 4 days trip to Tashkent. The biggest prize is 4 nights 5 Days trip to Taipei during COMPUTEX 2018 including the exhibition ticket, ECS HQ visit and gala dinner. “Not only we would like to encourage our partners to experience LIVA family product, we also want to thanks our partners’ supports by making LIVA as most preferred brand for enterprises & consumers” said Rajshekhar Bhatt, ECS India country manager. “For this promotion, we include the trip to Taipei, which is ECS HQ, and also invite partners to visit COMPUTEX 2018. We want to create a chance for our partners to experience the latest technology, and we also hope that by visiting ECS HQ, our partners can know more about us and to we can work closer with them in the future. For more details you can get in touch with us or nearest Rashi Peripherals Pvt Ltd office.” he added further. For more information, contact at Bhattrajshekhar@ecs.com.tw. ECS rolls out rewarding promotion: Fly to COMPUTEX 2018 5 out of 5 based on 1 ratings. 1 user reviews.